australias_cheapest_dvds has no other items for sale. 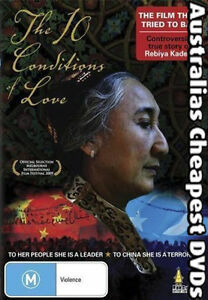 The 10 Conditions of Love follows the struggle of Rebiya Kadeer, the leader of the Uyghur people, the oppressed Muslim population of Chinas Xinjiang province. Kadeer now lives in exile in the United States. Here she is quickly gaining influential friends and media coverage to help her campaign for her people's human rights. As a result, her children are in prison in China. Immediate payment of AU $7.39 is required.